In Michaelangelo #1, Mikey is out walking during the Christmas holiday, enjoying the sights and atmosphere. 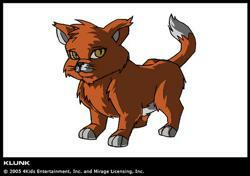 On his travels he finds a stray cat that he picks up and names Klunk. In The Path, Klunk gets hit by a car and is dying fast. Mikey takes Klunk to a magic man at a dump because he thinks that he can save the kitty’s life. The magic man tells Mikey that the only way to save Klunk’s life is to exchange it for that of another cat. So Mikey finds the nearest stray, drags it to the magic man and tells him to go through with the ritual. As Mike tries to rationalize why Klunk deserves to live and the stray deserves to die, he stumbles and says “nobody loves it”, suddenly realizing that what he’s doing is wrong. Now accepting that he’s powerless to save Klunk’s life, he bids farewell to his little kitty as he dies. Mikey later learns that the stray was actually pregnant with Klunk’s babies and adopts one of them as his new pet. While enjoying a Christmas eve on the surface, Michelangelo found a stray kitten and named it Klunk. He decided to keep Klunk as a pet. Klunk was caught in a Purple Dragon battle, but escaped unharmed with Mikey. When the Foot Mystics used their ninja abilities to plague the five members of the TMNT’s minds, they dream’t Klunk drowned whenBishop flooded their lair. Klunk is seen in one episode of BTTS. Klunk made several appearances in other episodes but most of them were cameos. Some of the episodes are listed below. Klunk, along with Serling, does not appear in Turtles Forever. If you know a episode that Klunk was in that isn’t listed please add it.